Complicit. James Carroll writes well in both fiction and non-fiction. While I’ve gotten bogged down with many of his non-fiction works and left them unfinished, I totally enjoyed his latest novel, Warburg in Rome. Set in Rome toward the end of World War II, Carroll assembles a cast of interesting characters who are trying to deal with the problems of that time, especially the plight of Jewish refugees. Carroll presents the complicity of the Vatican in their dealings with Nazis, while profiling the courage of some church officials to aid the Jews who were trying to flee persecution. By taking his knowledge of the history of this time period and creating fictional characters to embody the story, Carroll avoids the didactic nature of nonfiction and tells us about this time in a way that’s engaging and interesting to any reader. Rating: Five-star (I love it) Click here to purchase Warburg in Rome from amazon.com. Lime. During a recent hot afternoon when it was too uncomfortable to sit in the garden, I retreated to the cool indoors and spent a pleasant few hours reading Catherine Aird’s latest Sloan and Crosby mystery novel titled, Dead Heading. Before I knew it, I was drawn into the overlapping cases of a greenhouse break-in that destroyed expensive orchids and the case of a missing person. Once Aird referred to lime, I suspected foul play, and was rewarded when the plot turned out exactly as I expected. For the last fifty pages or so, the gin and tonic by my side was the perfect accompaniment, especially with the visible slice of lime in the glass. Any reader who likes witty and entertaining crime fiction should consider reading this novel and this series. Rating: Four-star (I like it) Click here to purchase Dead Heading from amazon.com. Sisters. My first thought upon finishing Amy Bloom’s novel, Lucky Us, was how did she pack so much into 250 pages? Bloom draws us into the lives of two sisters, Iris and Eve, during the 1940s. Every life has ups and downs, but what happened to these two in a decade packs a wallop. Considering the severity of their setbacks, the title might seem ironic, but oddly enough it isn’t. Bloom accomplishes something most writers aspire to, but rarely achieve: a deep empathy among readers for what has happened to fictional characters, and from that empathy a deeper understanding of human nature, and the overpowering impact of love. Rating: Four-star (I like it) Click here to purchase Lucky Us from amazon.com. Reputation. The sixth Bess Crawford novel by Charles Todd is titled, An Unwilling Accomplice. There are great plot twists in this very satisfying mystery. Bess’ reputation is sullied when a solider under her nursing care goes AWOL. She decides to search for him, and the plot revolves around how that search leads her to more trouble. Readers who enjoy character-driven mysteries with plot complications are those most likely to enjoy reading this novel. Rating: Four-star (I like it) Click here to purchase An Unwilling Accomplice from amazon.com. Insight. When I first read a blurb about Anthony Doerr’s novel, All the Light We Cannot See, my first thought was that the last way I wanted to spend time was reading another book set during World War II, let alone one containing more than five hundred pages. I didn’t expect much especially from themes of blindness and radio waves. I decided to start reading it, and I’m delighted that I did. Doerr’s novel is among the best I’ve read this year for several reasons. The plot kept me interested from beginning to end. The finely written prose provided just the right level of description, imagery and dialogue. Character development provided one component the best novels always offer: insight into our human condition and the values that underlie our behavior. The structure of the novel with shifting time periods and narrators drew me in to the story, developed the characters and mesmerized me through finely written lyrical prose. I highly recommend this novel to any reader. Rating: Five-star (I love it) Click here to purchase All the Light We Cannot See from amazon.com. Pharma. Having read thousands of books, it’s rare for me to be surprised by what a writer can achieve. Daryl Gregory got me to laugh often while reading his novel, Afterparty, especially during its most dystopian passages. Set in the near future, the novel presents the drug named numinous, created as a treatment for schizophrenia. Gregory riffs on the interplay of God and science as well as the nature of religious belief. On top of the themes explored, he structures a mystery, which kept the plot moving. I finished the novel thinking something along the lines of: wasn’t that interesting? Perhaps it would have helped had I taken the right combination of pharmaceuticals to develop empathy for the characters. Instead of empathy, I closed this book and opened another. I suggest reading an excerpt before you dive in, since your reaction depends more on the condition of your brain, not mine. Rating: Three-star (It’s ok) Click here to purchase Afterparty from amazon.com. Health. Eat American seafood. That’s the pitch from Paul Greenberg in his book titled, American Catch: The Fight for Our Local Seafood. He focuses on oysters, shrimp and sockeye salmon, and tells of what happened in the past, what’s being done today, and what needs to be done in the future. This book is a manifesto on the need to ensure the health and integrity of our coastal ecosystems. Greenberg rails on how we export vast amounts of healthy salmon and import less healthy seafood raised abroad. Hence the message: eat American seafood. That’s the practical advice that need not come from a book, but readers interested in public health and public policy are those most likely to enjoy reading this book. Rating: Four-star (I like it) Click here to purchase American Catch from amazon.com. Letters. Boris Fishman’s debut novel, A Replacement Life, captures the many ways in which our lives are a jumble of contrasts. Protagonist Slava Gelman is a writer living in Brooklyn who has been manipulated by his grandfather to write a false claim for restitution from Germany for what happened to the grandfather during the Holocaust. While the grandfather suffered during that time, what happened to him in real life doesn’t qualify for restitution, so a replacement life has to be created. Who better than his grandson the writer who works at a prestigious magazine to do this? The things we do for love. One letter leads to another. In the meantime, there’s a love story. Also the work at the magazine isn’t quite the American dream Slava expected. There are plenty of novels of the immigrant experience, and this one is funny, interesting, and alive. I enjoyed it thoroughly, especially the pitch-perfect dialect of Brooklyn’s Russian Jewish community. Rating: Four-star (I like it) Click here to purchase A Replacement Life from amazon.com. Introspective. Gabriel Weston uses great restraint in her novel titled, Dirty Work, as she sends readers on a month-long internal journey with narrator and protagonist Nancy Mullion. Nancy is a surgeon who has been suspended because of a botched procedure. As she awaits the verdict of a review panel, she reflects back on what happened in the operating room that day. Weston structures the novel one week at a time, as we follow Nancy in real time and in the past. This debut novel takes readers into a situation fraught with psychological tension, and Weston capably helps us understand human nature and I closed this novel with greater insight. Rating: Four-star (I like it) Click here to purchase Dirty Work from amazon.com. Partners. Fans of character-driven crime fiction are those readers most likely to enjoy the second Cormoran Strike novel titled, The Silkworm, by J.K. Rowling writing as Robert Galbraith. Private detective Strike has become choosy in selecting clients following the publicity he received after besting the police in solving a high profile case. When a strange woman with no obvious means for paying him asks him to find her missing husband, Strike ditches a bossy and rich client and takes on her case. Both Strike and his apprentice, Robin Ellacot, are developed with greater complexity in this novel, and their partnership provides the glue that holds the novel together. The story is grisly, the sleuthing interesting, and the resolution satisfying. Rating: Four-star (I like it) Click here to purchase The Silkworm from amazon.com. Mending. The Magicans trilogy comes to a very satisfying conclusion with Lev Grossman’s novel, The Magican’s Land. The first novel presented a coming of age story, and the second a quest for meaning. In the third novel, we find protagonist Quentin Coldwater as an adult who has been thrown out of Fillory and fired from his job at Brakebills. Quentin learns that what he is best at is the skill of mending, and it is his behavior as an adult that completes this trilogy so effectively. Grossman tells a great story in this novel and in the trilogy, and any fan of fiction, no matter what genre, will likely find pleasure in this story. Rating: Five-star (I love it) Click here to purchase The Magican’s Land from amazon.com. Identity. I took me longer to read Jonathan Lethem’s novel, Dissident Gardens, than any other book in the past decade. That’s not because I’m a slow reader: I read two hundred other books since I first opened this novel eight months ago. What kept me constrained in rushing along with this one is that Lethem’s sentences are worth close attention, and the plot creates no sense of urgency. He explores three generations of a family and uses multiple narrators to present their story. Each of the key characters in the novel is radical in some way, and each develops identity in the context of family and as individuals breaking away from family. The radicalism is something of an inheritance, and provides strength to the bonds across generations. We look to novels to tell us something about human nature, and Lethem does that in this quirky novel, and he does it by constructing sentences that are worth reading slowly and more than once. Readers who appreciate literary fiction are those most likely to enjoy this novel. Rating: Four-star (I like it) Click here to purchase Dissident Gardens from amazon.com. Bias. Six decades of nutritional advice to eat a low fat diet represents a failed experiment, according to Nina Teicholz in her fascinating book, The Big Fat Surprise: Why Butter, Meat and Cheese Belong in a Healthy Diet. As an investigative journalist, Teicholz took a questioning approach as she researched where nutritional advice has come from and the science underlying that advice. She makes a convincing case that many of the studies were seriously flawed, and that our feat of saturated fats is unsubstantiated. If you find this counterintuitive, read the book and you’re likely to be convinced by her research. Reducing fat in the diet led to increased carbohydrates, more sugar, and an increased risk of disease and weight gain. Devotees of the Atkins diet will find vindication in this book. After I read this book, I enjoyed an extra-thick marbled rib eye steak, finished with a pad of butter. Next up: bacon and eggs for breakfast, all items from the local farmers’ market. Rating: Four-star (I like it) Click here to purchase The Big Fat Surprise from amazon.com. Bullies. Chevy Stevens tested my patience to its limits as I read her novel titled, That Night. Protagonist Toni Murphy was convicted along with her boyfriend of killing her sister. Stevens provides lengthy exposition through presenting the current time, Toni’s release from prison two decades after the crime, and exposition of what happened in Toni’s life during high school. There’s a recurring theme of bullying in the novel, which Stevens presents with vivid detail. By the time Toni begins her investigation into what really happened on the night her sister was killed, I was interested in all the characters, and couldn’t wait until the mystery was solved. Patient readers will be rewarded by this story, thanks to Stevens’ understanding of the lives she presents and how well that comes across in her writing. Rating: Four-star (I like it) Click here to purchase That Night from amazon.com. Transformations. Each of the nine stories in the collection by Francesca Marciano titled, The Other Language, explores some aspect of a transformation. Characters face life changes, are thrust into new places, or find that an object takes on the power of being able to change one’s life. Readers who enjoy short stories can parcel these out one at a time and find pleasure from a variety of settings and characters, thanks to Marciano’s fine writing. Rating: Four-star (I like it) Click here to purchase The Other Language from amazon.com. Care. I read Roz Chast’s book, Can't We Talk about Something More Pleasant? : A Memoir, in a single sitting. I’ve been thinking about what I read for days after I closed the book. There are many chances to smile and cry as we read about Chast’s care for her aging parents. Anyone who has cared for aging parents, whether close up or from a distance, will find empathy for Chast’s situation. Chast fills most of the book with this story in cartoon form, and supplements that with some photos that add to what she conveys. Rating: Five-star (I love it) Click here to purchase Can’t We Talk about Something More Pleasant from amazon.com. Meaning. Fiction from veterans of the wars in Iraq and Afghanistan seems to be getting better and better. The best I’ve read so far is Redeployment by Phil Klay, a collection of short stories. In most of these stories, we meet characters who are searching for meaning. There’s brutality, chaos, fear and guilt, alongside friendship, caring and survival. What makes me love these stories so much is Klay’s finely written prose. Klay can pack a wallop in a single sentence, and I read many of them more than once. This is a great collection from a thoughtful and talented writer. Rating: Five-star (I love it) Click here to purchase Redeployment from amazon.com. Entertaining. 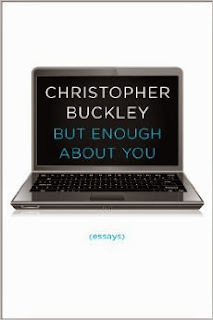 I tried to restrain myself and parcel out only one essay per day from the new collection from Christopher Buckley titled, But Enough About You. I failed. I could not read just one. After being entertained by one, I found myself reading one more, and then perhaps another. Buckley tickles my funny bone in a way that seems effortless, but belies the great skill he deploys in choosing just the right words. The range of these 100 essays is broad and deep: from travel to book reviews to social commentary to eulogy to child rearing to eating well to friendship to speechwriting to politics. For each topic, Buckley applies a wit and style that entertained me thoroughly. Rating: Four-star (I like it) Click here to purchase But Enough About You from amazon.com. Lured. If you consider yourself immune from con artists, be sure to read Walter Kirn’s book titled, Blood Will Out: The True Story of a Murder, a Mystery, and a Masquerade. In this non-fiction book that reads like a novel, Kirn is lured by a master manipulator he knows as Clark Rockefeller. The fact that Kirn spent more than a dozen years under the influence of this con man leads a reader to think Kirn is totally gullible or the Rockefeller imposter must have been quite a convincing character. This is the kind of story of a train wreck that I couldn’t look away from. I had to read to the end. After reading the book, I concluded that Kirn may have been susceptible to manipulation, and that Clark Rockefeller was a very skilled con artist. Read for yourself and feel that sense of schadenfreude, thankful that it was Kirn, not you, who was manipulated. Rating: Four-star (I like it) Click here to purchase Blood Will Out from amazon.com. Freelance. The latest novel by Paul Doiron to feature protagonist Mike Bowditch is titled, The Bone Orchard. While Mike quit being a Maine Game Warden because of politics, he doesn’t stop investigating. He abandons his job as a guide to pursue the person who shot his mentor, Kathy Frost. This freelance work allows Mike to follow his own rules, the same path that got him in trouble when he was a warden. The characters are fully developed, the plot is entertaining, and the setting is written with enough descriptive language to bring all readers to Maine. Anyone who likes crime fiction with strong central characters is likely to enjoy this novel and this series. Rating: Four-star (I like it) Click here to purchase The Bone Orchard from amazon.com. Guilt. Karin Fossum’s psychological novel, I Can See in the Dark, explores guilt. Riktor is both narrator and protagonist. Many readers will shiver as Riktor unravels his story. Fossum allows us to see the way that conscience operates, and how justice can be achieved. It can be disturbing to enter into the brain of a sociopath as this novel leads us, but I found it fascinating. Readers who can handle disturbing fiction are those most likely to enjoy the darkness in this finely written novel. Rating: Four-star (I like it) Click here to purchase I Can See in the Dark from amazon.com. Rescue. Fans of Dennis Lehane’s fiction will enjoy reading The Drop. What began as a short story was turned into a movie screenplay. This is the version of the screenplay written as a novel. Protagonist Bob Saginowski leaves his bartending job at Cousin Marv’s and finds a hurt and abandoned dog he names Rocco. As he rescues the dog, he also meets Nadia. The Chechen mafia own Cousin Marv’s and it would not be wise to cross them. The dog’s owner is not a paragon of societal virtue. The action is compelling, the characters interesting, and the novel wraps up pretty soon after it starts. This is perfect reading for a short airplane flight, especially one to Boston, so one is prepared for that landscape and all the possible things that can happen in that place. Rating: Four-star (I like it) Click here to purchase The Drop from amazon.com. Quotes. One luxury that can come from being very successful is to redefine what success should mean for others. Arianna Huffington strings together dozens of practical pieces of advices and quotes from others in a book titled, Thrive: The Third Metric to Redefining Success and Creating a Life of Well-Being, Wisdom, and Wonder. For those readers who enjoy celebrity self-help books, this is the book for you. She suggests that we all get a good night’s sleep. Start the day with meditation. Unplug more often from electronic devices. If this is the kind of help you’re looking to find out from a book, consider reading this one. I read it quickly and agreed with her often, but I wondered about the audience for a book such as this one. Rating: Three-star (It’s ok) Click here to purchase Thrive from amazon.com. Betrayal. Fans of spy fiction and historical fiction set in the early twentieth century are those most likely to enjoy reading David Downing’s novel titled, Jack of Spies. The run up to World War I was an exciting time, and Downing’s plot moves protagonist Jack McColl from China across the US and on to Mexico, England and Ireland. McColl aspires to leave his job as a luxury car salesman and become a spy for the Royal Navy. I enjoyed both the well-developed characters and Downing’s presentation of the time period. Tension in the novel is less than in many spy novels, as betrayal is the basis for all spy work, and that’s what happens here. I had the sense that this is the beginning of a series, and Downing leaves us wanting to enter the war with McColl and see what might happen next. Rating: Four-star (I like it) Click here to purchase Jack of Spies from amazon.com. Wildfire. Readers who enjoy getting chills while reading thrillers are those most likely to enjoy reading Michael Koryta’s fast-paced novel titled, Those Who Wish Me Dead. Protagonist Jace Wilson is a fourteen-year old boy who found himself in the wrong place at the wrong time. He observed two creepy guys, the Blackwell brothers, kill someone. Now, as the title references, they wish him dead. Jace receives a new identity and is sent to Montana’s wilderness while the police track down the Blackwells. The action accelerates on every page, and the plot twists are very satisfying. Fire plays a big part in this novel, and with all the wildfires in the American west this year, I could almost smell the smoke as I read this entertaining novel. Rating: Four-star (I like it) Click here to purchase Those Who Wish Me Dead from amazon.com.